The network perspective and its accompanying style of analysis – social network analysis (SNA), and more generally network analysis – is a growing trend within the field of social-ecological studies and resilience research. At the recent conference Resilience 2011, 11-16 March in Tempe, Arizona, USA, my quick overview after having been there noted a growing number of papers that were based on network analysis, or a network perspective, especially when compared with the number of network papers at the Resilience 2008 conference in Stockholm. Although a proper analysis needs to be made, it seems clear that the overall number of presentations were many more in 2011, but likely also the ratio of presentations in comparison with the total, and the scope of problems addressed. A new trend this time, although I did a presentation at the SUNBELT conference in Italy last year on the subject, was the focus and special session on ‘social-ecological network analysis’ (SENA). To this trend we can add the growing number of published papers, chapters and books and special sessions at international conferences. To these publications there is also a growing number of special sessions that has been organized at conferences on how to use SNA in ecosystem governance studies, including at least: IHDP in Bonn 2009, SUNBELT 2010 in Trento, and now Resilience 2011 in Phoenix/Tempe. As evidence of a growing epistemic community, we can also add our e-group NASEBERRY, and the courses given during these last couple of years (e.g. this one). Resilience research is an ascendant paradigm aiming to explore the structural features of adaptive and robust ecosystems, societies, enterprises, and economies. Network theory provides a robust language to better describe and understand those features. The workshop will bring together the fields of resilience research & network theory and will demonstrate their value for adaptive management and strategy development in politics, economy, environment, and society. What is the evidence of resilience within a specific system? What are the threats for resiliency in a specific system? What role do networks play in the design of decision making structures? I conclude my trend spotting with this seemingly very interesting workshop. 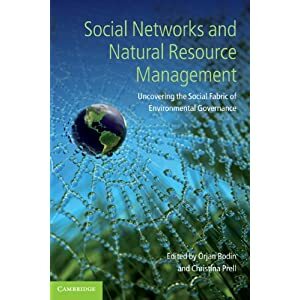 *Both the book and special issue serves as a very good introduction to network analysis in social-ecological studies, alongside other reading lists.